It feels like there are more and more dashboard symbols on cars these days and, in an age of self-diagnostics a-la Star Trek, if a symbol flashes on your dashboard your car is warning you something is not quite right and requires your attention. All cars are different and can offer a different look to the driver depending on the make. But many of the most important warning signs and symbols are fairly consistent. The important thing is to check the warning light with the handbook and then act accordingly. If you have any worries about a particular warning symbol or are not totally sure what it means or what to do, then give us a call at David Dexters and a member of our helpful team will talk you through it and sort the problem out. If this light comes on get a mechanic to look at the car immediately. This could be something serious and early diagnosis could save you a lot of problems . . . and money. It could, on the other hand, be a faulty sensor – but you can’t take the chance, it needs to be addressed. These are usually shown in the form of an oil can and temperature gauge. 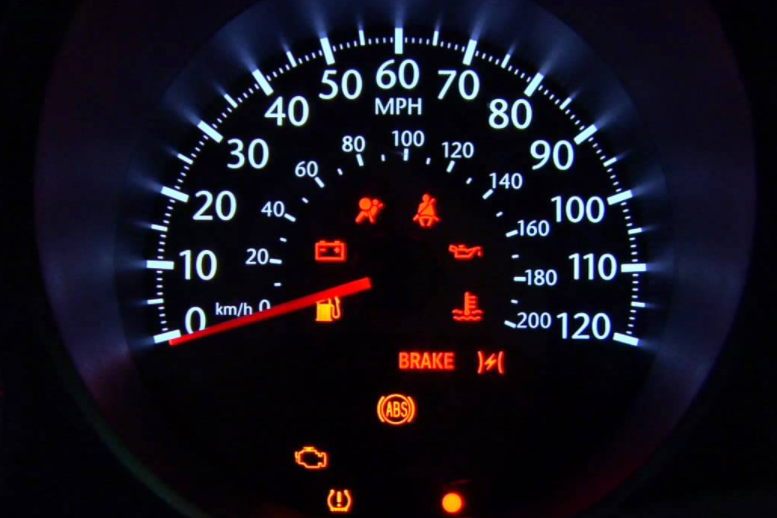 If the lights are on it could mean your oil/coolant levels are low and in need of topping up. Running either too low is not good news and will result in overheating and potential serious damage. If this light comes on then there is something wrong with the brakes and it must be sorted out immediately. Your brakes are vitally important and this warning symbol is not something to be ignored. On a lot of cars this is the same light that comes on when your handbrake is on – so it only a problem if the light is on when you’re handbrake is off. More cars are being fitted with this alert on modern-day dashboards. Your tyres are the only point of contact with the road, so are another vital piece of equipment to keep in tip-top condition. If the symbol flashes check your tyres. Other symbols can warn of an open door or boot, deactivated airbag, ABS fault or battery/alternator alert – things that range in levels of seriousness across the dashboard, but all aimed at informing the driver of an issue or potential issue with the car. Don’t ignore the warning signs – take action, consult the handbook and, where necessary, seek expert advice.